Many of my recent pieces incorporate a curved element with a dot pattern. 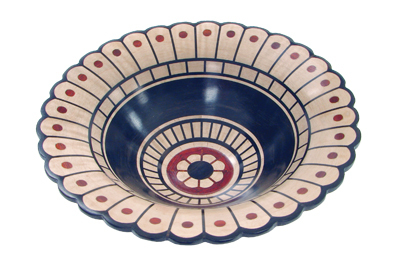 In the 'Flower Petal Bowl', these elements are evident in the scalloped rim and the centre medallion. I am pleased with the way the curved shapes and roundness of the turnings complement each other and I find these elements technically challenging enough to keep my interest up and I expect to utilise them in a number of future turnings. I used segmented construction to create this piece. The rounded shapes minimise the conventional stacked ring look often seen in this type of work. Tight dimensional and flatness tolerances are a must. To ensure a good fit, each individual part in this turning was sanded to size and at the correct angle on a disc sander before gluing up the 450 pieces that the bowl is comprised of. To create the dots, holes were drilled and reamed to a taper then tapered plugs were glued into place. All the grain in the piece runs in the same direction to allow for wood movement. I prefer using exotic hardwoods in my work because of the extensive variety of colours and textures available. In this turning, I used bloodwood (Pterocarpus angolensis), ebony (Diospyros spp.) and curly maple (Acer campestre). They offer great contrast and are three of my favourite woods. The bowl is finished with a tung oil/polyurethane mixture that works well to bring out the figure in the maple.